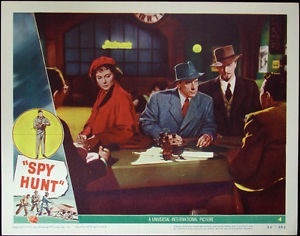 Also known as SPY HUNT, this film is based on the Victor Canning novel and is a good spy story,with Marta Toren trying to get some microfilm back to British Intelligence. Marta knows she is being followed (beware Ivan Triesault!). On a train to Paris she encounters Howard Duff who is minding his own business while escorting two black panthers from a private zoo to a circus. Desperate for somewhere to hide the film,she puts it in the collar of one of the panthers when it is asleep! The train is travelling through Switzerland when the carriage that Duff and the caged panthers are in is deliberately unhooked from the rest of the train and crashes – the panthers escape. The scene changes to a Swiss hotel where doctor Walter Slezak tends Duff’s wounds. 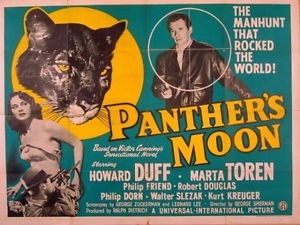 Also in the hotel, after hearing the news of the escaped animals , are Kurt Kreuger,an army officer ready to find and kill the panthers; Philip Friend,a foreign correspondent, there for the story; Philip Dorn is a big game hunter who’d like to bag a panther; and Robert Douglas ,an artist, who would just like to sketch the panthers. So all the players are assembled. One of them is as keen as Marta to get that microfilm, as the search for the panthers begins. It’s an enjoyable action thriller, though I did feel sorry for the panthers.